This salad was inspired by a prepared salad Rob would occasionally pick up from one of our local high-end grocery chains ... a delicious combination of flavors and textures, but expensive at nearly $9 apiece, and wasteful, due to the many disposable plastic containers the store used to keep the individual salad components fresh. I decided to re-vamp the salad as a homemade, portable version, adding a few of my own tweaks and adaptations. Enjoy! 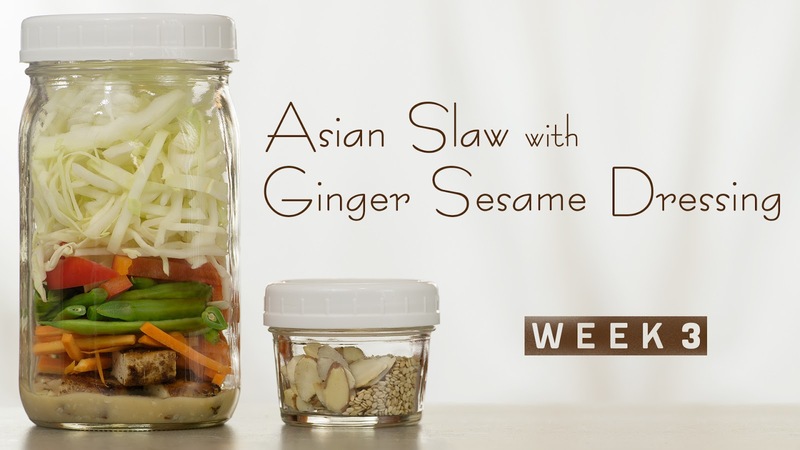 Make the ginger-sesame dressing: combine 1 tbsp sesame seeds, garlic, ginger, rice vinegar, soy sauce, sugar, and oils in a pint-sized mason jar. Puree and emulsify the dressing using a handheld stick blender. (Alternately, puree and emulsify the dressing ingredients in a blender or mini food processor.) Reserve 1/2 cup dressing. Cook the chicken: Add 1 tsp Chinese 5-spice powder to the remaining dressing. Marinade the chicken thighs in the 5-spice dressing for 20 minutes (or longer if you have the time.) Roast the chicken thighs at 350 degrees Fahrenheit for 45 minutes, or until fully cooked. (Alternately, grill the chicken thighs until fully cooked.) Cool, then dice the chicken into bite-sized pieces. Pack the salads: add 2 tbsp remaining dressing to each of 4 tall quart-sized containers. Layer the chicken, carrots, green beans, red bell pepper, and cabbage in the jars. Add 1 tbsp almonds and 1 tbsp sesame seeds to each of 4 2-ounce jars or snack-size zip-top bags for each salad. Refrigerate until serving. Enjoy your salad: invert your salad onto a plate or into a bowl. Top with sesame seeds and almonds. 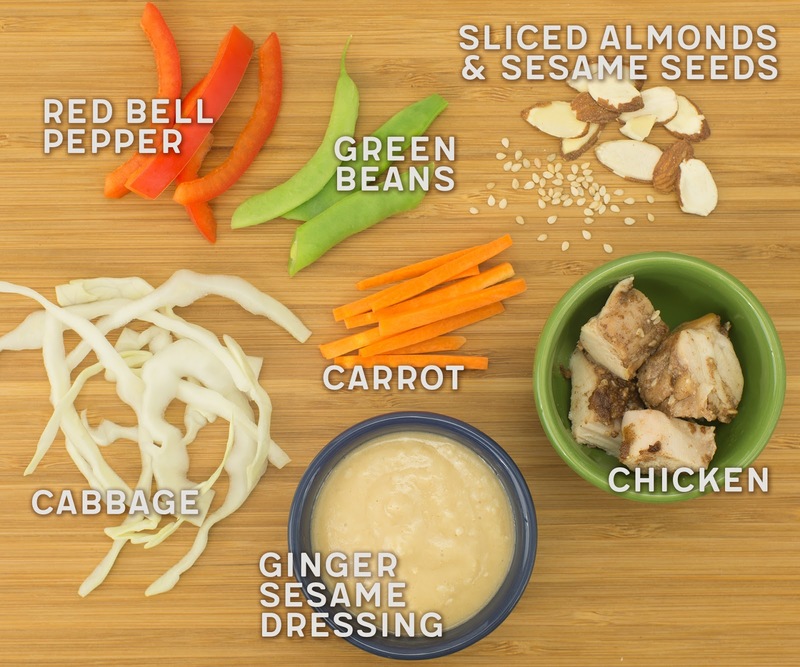 TIME-SAVING TIPS: Substitute your favorite bottled Asian-style salad dressing for the ginger-sesame dressing. Use store-bought rotisserie chicken in place of the marinaded chicken thighs. Substitute 1 package pre-shredded coleslaw mix for the cabbage and carrot. SPECIAL DIET SWAPS: For a vegetarian/vegan salad, substitute 1 14-oz package water-packed extra-firm tofu, drained and pressed, for the chicken. For gluten-free diners, choose oils and vinegar labeled "gluten-free," and substitute gluten-free tamari for the soy sauce.